Update #2--BoingBoing published proof that Malkin was right. Wink, wink. When I read that Michelle Malkin and Little Green Footballs thought that the woman pictured left were "casually promot[ing] the symbol of Palestinian terrorism and the intifada, the kaffiyeh," (with the title of Mainstreaming Terrorism to Sell Doughnuts, yet) I wondered what the readers of those blogs had been drinking. Not coffee, evidently. The woman is Rachel Ray, who has a sort of fast-easy cooking empire. The fringed -scarf -looped -around -the -neck-and-hanging-down look was ubiquitious in England, and I see it a lot on cooler days here in the Bay Area--especially with tshirts. Check out this spread from BleuDame showing a lot of scarves worn just that way. "Everybody is wearing them on the street," said Thompson, 41, whose main display in the storefront window is a female mannequin wearing a stylized purple hooded sweatshirt, a matching baseball hat, and a black and white kuffiyeh, the scarf's traditional name. "They wear anything in style; they don't even know the meaning." The kuffiyeh, traditionally a symbol of Palestinian nationalism, is gaining popularity in hip-hop fashion in New York, Washington, D.C., San Francisco and other cities — and losing its potent symbolism in the process. Mainstream artists like Kanye West, Justin Timberlake and Chris Brown have sported the checkered Middle Eastern scarf in recent months, fueling a long-running debate on the commercial adoption of the politically charged square fabric popularized by Yasser Arafat, Hamas militants and others. "People like Jay-Z, Jermaine Dupri and other mainstream hip-hop guys wearing it is the new development," said Ted Swedenburg, a professor of anthropology at the University of Arkansas who has studied the kuffiyeh and its place in American fashion. "The tendency is towards diluting the political message." I seriously doubt that either Ray or Dunkin' Donuts chose the scarf. Some stylist on the ad shoot--probably politically naive--draped it around Ray's neck to give her a little urban edge. Malkin and LGF's readers need to get out more. 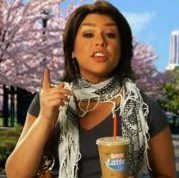 Dunkin Donuts' statement on the matter answered your last point - a stylist on the shoot threw it together, and it apparently had nothing to do with Ms. Ray or DD. Would you like to know what I, as a reader of Malkin, Hot Air and Charles Johnson, drink? It's been not uncommon in the UK for decades; I remember them being fairly popular when I was at university in the late 1970s. I don't know if the meaning has changed, but then (usually worn with army-surplus combat jacket) it was very much associated with posers of the "Look, I'm politically radical" flavour rather than any specific national affiliation.